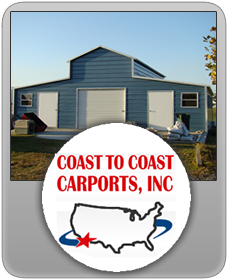 Everyone that buys from Coast to Coast Carports is accustomed to having an excellent experience, all the way from the initial order to when their barn or carport is installed and they can use their new metal building. What you may not know about Coast to Coast is that all of our products, all the way from our metal barn roofing to the steel sheets we use in our production are top notch material and will last you for years. One of our major selling points is that all of the steel material we use has a 20 year warranty rust through of framing on roofing material assuming normal user care and maintenance. High Quality Metal Barn Roofing That Lasts! Our metal barn roofing is included in that warranty and that means that every barn or agricultural building that you buy from Coast to Coast will last that long. When you make an investment to protect your livelihood you need it to last, and that is what you get when you buy from Coast to Coast. Don’t waste time looking at other inferior forms of protection for your equipment and crops; make sure that you buy from Coast to Coast and get your buildings installed with our great metal barn roofing. But another important thing is that your barns look professional. When people come to visit your farm their first impression can make or break your working relationship with them. That is why you can choose from twelve different colors for your barn, and with our popular colonial option you can choose two colors. This professional look ensures that your barn will look great, and with the great warranty you cannot go wrong when you buy at Coast to Coast Carports.